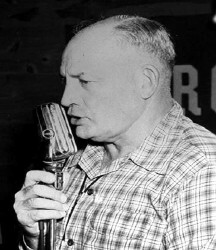 Duke Miller was a high-school football coach from upstate New York who called summer dances in southern New Hampshire from the 1950s until the late 1970s. Many musicians played for Duke over the years, including Bob McQuillen, who played accordion and piano for twenty-six consecutive summers - ten weeks each summer. Duke was well known for his singing calls and influenced many later callers, including Tod Whittemore and Mary DesRosiers, both of whom grew up attending his dances during the summers. When I started calling in the 1980s I learned a lot of Duke's material via Tod, and I was fortunate to attend one of Duke's last dances in Fitzwilliam NH. In 1988, John Derby of Peterborough NH brought me a tape recording that he made of a Duke Miller dance that was held at the Peterborough Golf Club on August 20, 1965. John wanted me to edit the recording and transfer it to cassette for him, and he let me keep a copy for myself. These many years later, I have converted the cassette to digital format, and here it is. I thank John for preserving this interesting glimpse into New England dance history. The dances are presented in the order that they were recorded on the tape. Thanks to Sylvia Miskoe and Tony Parkes for helping identify some of the dances and the tunes. If you have any other information, I would love to hear it.